The way Maria Whyte and Anita Hufft have it figured, this was bound to happen. They became nurses, decades apart, but the circumstances of their first meeting fated them to meet again. At the very least, it’s a really small world. Little Maria was an Army baby in the Vietnam War era, born in Puerto Rico three months premature. She was taken to the neonatal unit at Washington D.C.’s Walter Reed Hospital, where she had an extended stay, and where Hufft (she was Anita Goldberg then) was doing her student training. “Absolutely I feel it was destined,” says Whyte. “Yeah, I like to think it was meant to be,” Hufft adds. What was destined and meant to be is the two of them working together. Hufft is the dean of the College of Nursing at Valdosta State University. She refers to Whyte, the college’s graduate program coordinator, as her second in command. Together, along with college nursing educators around the state, they’re working to overcome a troubling set of circumstances – a national nursing shortage that will only intensify as the bloated baby boom generation lurches into old age while nursing programs struggle to expand enrollment to meet the rising demand. According to the American Association of Colleges of Nursing (AACN), nursing schools nationwide turned away 67,563 qualified applicants from baccalaureate and graduate programs in 2010 due to a shortage of faculty, clinical sites, classroom space and clinical preceptors, as well as budget constraints. Georgia nursing schools turned away about 2,000. The average age of an RN (registered nurse) is almost 45. Meanwhile, the average age of a doctorally prepared professor is 60 (almost 58 for a master’s-prepared professor). At the same time, organizations such as the Institute of Medicine (IOM, the health arm of the National Academy of Sciences) are calling for a more educated workforce to meet the increasingly complex demands of the 21st century healthcare system. The IOM is recommending that the proportion of RNs with baccalaureate degrees be increased to 80 percent by 2020 (currently it’s about 40 percent, as most RNs have associate degrees or hospital diplomas). More RNs are returning to school for their Bachelor of Science in Nursing (BSN) while the number of graduate students also rises – a master’s or doctoral level degree is required for nurses who want to be nurse practitioners (NPs, who typically act as primary care providers), researchers or faculty, all of which already are in great demand. “There are going to be more nurse practitioners out there, more mid-level providers as more physicians leave. That’s what the market is going to demand,” says Ann Marie Peck, a nurse practitioner in Habersham County who is working on her Doctor of Nursing Practice (DNP) at Brenau University. “And of course, it can only make me more marketable,” she adds. There are more choices now for working nurses who want to pursue more advanced degrees. To help meet the demand for better-educated nurses, the Board of Regents recently approved two-year schools Darton College and Georgia Highlands College to offer RN to BSN programs, and other colleges are working on proposals. North Georgia Col-lege and State University is trying to develop a DNP program, joining Brenau and others, like Georgia Southern, Georgia Health Sci-ences University and Mercer. This month, Georgia Trend checks in with the experts at four different universities that are preparing nurses and the people who teach them. The need for nursing faculty, therefore, will be more critical than ever. It’s something the University of West Georgia (UWG) is taking seriously, so it has created the state’s first doctoral program in nursing education. 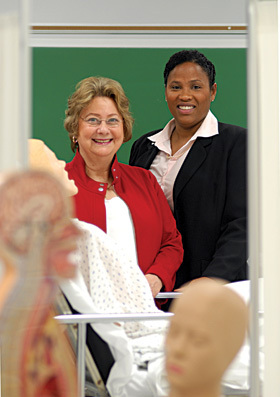 The program is a collaboration between the School of Nursing and UWG’s College of Education and will be of-fered entirely online beginning fall 2012; it is one of only four Doctor of Education (Ed.D.) in Nursing programs in the country. In developing a new wave of Ph.D.-level teachers, UWG is probably investing in itself. Grams expects to double enrollment (currently about 450 in the RN to BSN, and graduate programs) in the School of Nursing when its new 64,000-square-foot building (a $20-million project) is completed (by fall 2013) on the main campus in Carrollton. UWG did get some money for teachers – at its Newnan campus, which received a $2-million gift from Newnan Hospital Inc. (the largest gift in the university’s history). Grams says $1 million will go toward establishing an endowment for faculty development, and the other $1 million is for facilities enhancement. Virginia “Dare” Domico has been a nurse for more than 40 years. She’s nearing retirement with a growing anxiety over the national faculty shortage that she will be contributing to. “A huge number of faculty are retiring over the next several years,” says Domico, professor and associate dean for graduate programs at Mercer University’s Georgia Baptist College of Nursing in Atlanta. In particular, Domico is worried about the proposed federal legislation that would slash the national Nursing Work-force Development programs, which includes the elimination of some programs and a cut of almost 70 percent to the Nurse Faculty Loan program. Not a good place for Georgia Baptist, which added several doctoral programs over the last several years – a DNP program (primarily online) was added two years ago, and a Ph.D. in Nursing program (online and on site) is in its third year, with an education component. In addition to the 23 students in those programs, Georgia Baptist has approximately 300 undergrad students and about 50 in the Master of Science (MSN) in Nursing program. Domico, who worked in a clinical setting for a while, wasn’t planning on an academic career. But she’s been doing it for 30 years, knowing she could have made way more money in senior management at a hospital. Just wasn’t for her. When Gale Starich arrived for work at Brenau’s campus in Gainesville 10 years ago, the faculty was waiting for her. Brenau’s School of Nursing has an enrollment of almost 600, all told. That part-time BSN is the largest program, with more than 200 students, according to Starich. The school is going above and beyond in its effort to streamline a nurse’s education. There’s the typical RN to BSN program, totally online. It has students from as far away as Ohio and Alaska. For the clinical portion of the program, the student identifies a preceptor near his or her hometown, and that’s when Brenau goes the extra mile. Last fall Brenau started its first doctoral program – the DNP that Ann Marie Peck is enrolled in. She also earned her undergrad and master’s degrees at Brenau and has taught classes there. She goes to Brenau’s campus in Norcross once a month and takes classes online whenever she can, between her jobs in rural Habersham County as a primary care nurse practitioner at an OB-GYN clinic and an urgent care facility. Denise Sauls thought she had it all covered. She’d earned her BSN, and while working full time in a clinical setting figured she’d go after a Master’s in Education. This was 30 years ago. There was no such thing as an online course or flexible schedule. To teach undergraduate nursing students, she learned much later, after decades working in ICUs, dialysis centers and emergency rooms, she would need an MSN, Master of Science in Nursing. So recently, after 35 years as a nurse, Sauls remedied the situation and earned her MSN from Valdosta State, where Anita Hufft and Maria Whyte wound up working together, taking diverse, circuitous routes to reach their reunion. Hufft began in the Army Nurse Corps during the Vietnam era, part of a program at the Walter Reed Army Institute of Nursing to develop the next generation of nursing leaders. After the Army, she got bored, used her GI Bill money to pay for school, lived, studied and worked in Louisiana and Texas, earned her Ph.D., got into teaching, became dean at Indiana University Southeast, and was associate dean back at LSU before coming in 2004 to VSU, which is a short drive from her hometown, Tallahassee, Fla.
“The nice thing about nursing is you have a million and two opportunities to do anything, wherever you let your talents take you,” Hufft says. Whyte would have to agree. Married to a Marine while still a teen, she listened closely to what her new husband’s aunt had to say. “She was a 20-year nurse and said I should pick a college and look at their nursing program, because as a nurse, I could go anywhere and do anything while married to a Marine,” says Whyte, who put the theory to the test: California, Okinawa, South Carolina. Whyte was trained in a technical college by retired nuns “who didn’t feel like they were old enough to be forced into retirement, so they taught.” In the aftermath of Hurricane Hugo, they worked on the South Carolina coast, public health on a large scale, and she earned her BSN at University of South Carolina Aiken. After a stint in Virginia and graduate education, Whyte and her husband landed in South Georgia. She had a public health sensibility and gravitated toward an underserved population, eventually starting at VSU as adjunct faculty. VSU doesn’t offer a doctoral degree yet. Whyte says they’re going to submit a proposal for a DNP program. But they do have 50 students in the MSN program. They send graduate students and undergrads to work in migrant worker communities in the region and to clinical rotations in nursing homes and hospitals, and Hufft says she’s seeing more nurse practitioner grads staying in the economically challenged swath of Southwest Georgia.